Injured in the Line of Crafting? 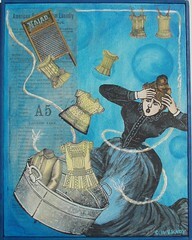 My First Sale on Etsy! 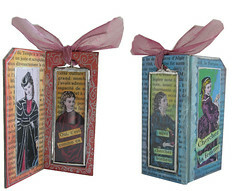 Lisa also named a kit after me "Carolyn's Artsy Medals" and they are already sold out! Some other things I couldn't show you. You can see the pile of bottle caps I made for the Art For All Goody Bag here. I think only 2 or 3 people guessed mine correctly (OK only about 10-11 people were hardy enough to submit their guesses - it was a tough contest) and a couple of people thought my space was Muppin's because of the fabric stuff. Nutty Nanner guessed mine correctly because I had lent her my hand-drill not realizing it was visible in the bottom corner of the right hand photo! Whew! I'm exhausted! (And still have one more load of laundry to wash and a whole lot of boxes to unpack) Art For All was exciting and exhausting! 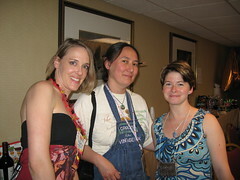 That's me above with Nancy (Nutty Nanner) and Kimberly (kbutts). 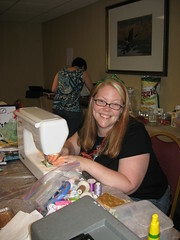 Here's my roommate Cheryl (Muppin) hard at work in the 24-hour art room. 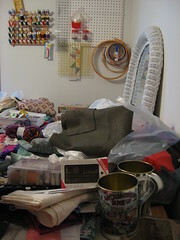 When I finally unpack everything, I will take some photos of the art I made in workshops. I took a calligraphy class from Bonnie (Balletbon), Metal Manipulation from Kimberly, Hand-carved Stamps from Shelly (Shoreart) and Mixed Media Paper Beads from Amy (amyfaerie). In the meantime, there's a whole Flickr set of mostly unlabeled photos from the event here. Just a quick post while my friend Bill is letting me borrow his computer. I'm in Indiana with very limited internet access visiting friends from grad school. 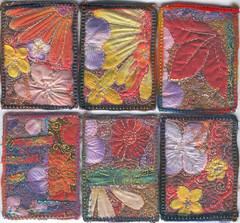 Friday and Saturday, I'll be at the Art For All meeting of folks from ATCs For All Above are some of the Artist Trading Cards made to trade at the event. You can see more of them on my Flickr site. More excitement as time allows! Have you ever been injured in the line of crafting? Then you deserve a medal! This was another Ten Two Studios design team challenge: use bottle caps and bamboo dominoes together. I am prone to all sorts of crafty boo-boos myself, having sewn through the side of my finger with my sewing machine or burned myself with my various irons. (We won't even talk about all the paper cuts!) 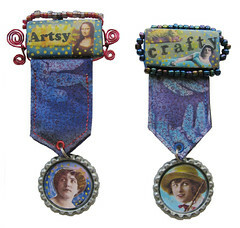 For those of you less accident prone, here are some general Medals of Artsy Crafty Honor. Keep an eye out at Ten Two Studios for limited edition artsy medal kits! Spring means I can get out the soldering iron at last. This is probably because our old house didn't have a kitchen vent fan, so I could only solder when it was warm enough to open the windows for ventilation. Now we have a fan over the stove, I could in theory solder all year round, but this was the first time I actually had the time and the inclination to set up. I am semi-self taught having read Lisa Vollrath's Metal Mania and her Metal & Glass Jewelry how-to CD and received an impromptu lesson from my big sister who does stained glass. 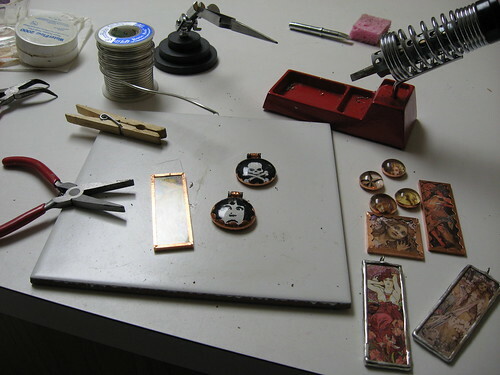 The microscope slide pendants above use images from the CD. I also wanted to experiment with the flat glass bubbles you find in the floral department of the craft store. These were tricky because they tend to spin right round, baby, right round (got that song stuck in your head yet?) until I could get the pendant holder soldered firmly so I had something to grip with the pliers. I used the Ten Two Studios Black & White Rounds for these two. Lisa had also challenged the Ten Two Studios design team to do something with microscope slide mailers, and I had a very literal interpretation, turning it into a holder for a soldered microslide pendant. I cut out the back so both sides of the pendant would show. 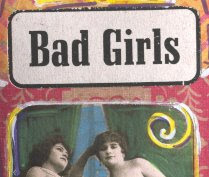 The ladies are from the Fashionable Jewels microslide set with a French text background. And I didn't even burn the house down! Catching up on my blogging a little at a time.... 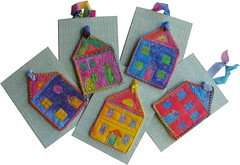 I made my first sale on Etsy - these house ornaments went off to Maryland to become end-of-year gifts for the teachers of my friend Jen's daughters - Thanks, Jen! Of course I promptly turned that money around into the purchase of these metal-working tools from BeadDestash that I've been saving up for since last Christmas! Gotta stimulate the economy! Well, it's been two weeks since my last blog post (I sound like a recovering blog-aholic) so I figured I'd best say something. I've been busy working (non-art, but it pays) and making stuff that I can't post images of yet. As you may know from my sidebar, I'm on the Ten Two Studios design team, and Lisa Vollrath sets us challenges to use a variety of her products in interesting ways. I'm currently working on the projects due July 1. I don't like to post them before they've gone up on the Ten Two Studios site, but above is a tiny sneak peek at something I sent Lisa yesterday. 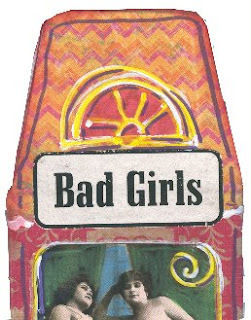 I'm also getting ready for a trip to Indianapolis the week after next to visit friends and attend the first ATCs For All gathering "Art For All" (June 19-21) where I'll get to meet a bunch of folks whom I've only known on-line, plus a few I've met in person before. The last count I heard was 47 of us attending! I'm working on my donation for the participant goody bags, but I can't tell you what it is until after they've been distributed! 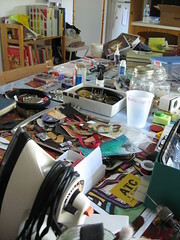 Oh, and I have to clean the house before I go out of town because some in-laws may stop by to visit and most of the mess in the dining room and living room is my art sprawl. *sigh* And now I have to go make some breakfast and wash some dishes! I'll try to write a post of "Stuff I Can Show You" later this weekend, but don't hold your breath! I have a LOT of house cleaning to do!